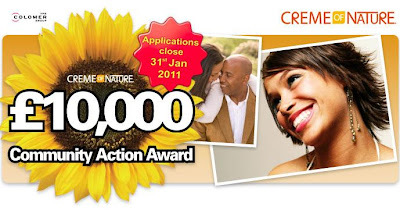 Last chance to apply for the UK 2011 Creme of Nature Community Action Award. Applications for the Award have to be in by the 31st January 2011. The Creme of Nature Community Action Award is all about giving something back to the community that has supported one of the most well known brands in the hair and beauty market for the past 30 years. If you or your organisation has a dream, now is the chance to make it a reality. Imagine what £10,000 cash could do and what it could achieve, then tell us why you need it, and what you intend to do with it. Applications are welcome from individuals to small groups, but priority will be given to those who have an annual turnover of less than £50,000. This Award is all about making a real difference. So if you are small with a big idea and just lacking funding, the Creme of Nature Community Action Award could be just what you need to make your dreams come true and start to make a real difference to the community you serve. It’s up to you to decide what you could do with £10,000. Remember the Community Action Award is a single payment of £10,000. That can take any organisation a long time to save. It can transform the work you do today, into the work you dream of doing in future, for the community you serve. And remember there are 4 runners up cash awards as well. Applications can be sent from the 10th September 2010 – early applications are appreciated this year as the Judges may decide to meet more than once as the number of applications have increased over recent years, and it will give them greater opportunity to review your application. During February 2011 the Judges will announce the 5 finalist. The 2011 Award will be £10,000 and there will also be 4 runners up who will also receive cash awards. It will be up to each finalist to promote their cause and get the most online votes from the 1st March to the 31st March 2011. Votes can come from anywhere - one vote per person. It could be a lot of fun, and a great way to get your local community to find out what you do now and what you could do in the future if you won the award. The presentation will be in the Steve Biko Building in Manchester in late April or early May 2011.